Have you ever wanted to upload a “behind the scenes” video to your channel and don’t want this video to take up valuable real estate in subscribers’ feeds? Or uploaded a long video but also wanted to publish short clips? Maybe you want to publish a quick video without interrupting your publishing schedule? We’ve heard many creators want to upload public videos that don’t notify their subscribers in their homepage feed, via email (for opted in subscribers), and in youtube.com/my_subscriptions. Your default will remain that your subscribers are notified about your public uploads, but now you can choose to uncheck this option to “Notify subscribers” in the Advanced Settings section during the upload process. If you use our batch upload features in CMS, we also have an equivalent XML tag available. Public videos that you choose not to notify subscribers about will still be discoverable through search, suggested videos, and on your channel. In April, we launched one of the most requested features by creators, the ability to set the custom thumbnail directly in the upload interface, while the video is uploading. We received a lot of positive feedback about this change, but many of you pointed out that this would be even more convenient if you could upload the custom thumbnail earlier during the upload process, rather than towards the end. Beginning today, you can pick your preferred thumbnail right away, shortly after the video upload starts. We now have a simpler interface to input and manage your tags. Just type in the text for each tag, and either add a comma or hit enter. This will store the text as a distinct tag. Once the tag has been entered, the text will be surrounded by a blue box which indicates that the word or phrase you entered has been entered as a tag. We’re constantly working to make the upload process more efficient and effective for creators. Your feedback is always helpful and appreciated, so let us know at +YouTube Creators how we can continue to improve our publishing tools. 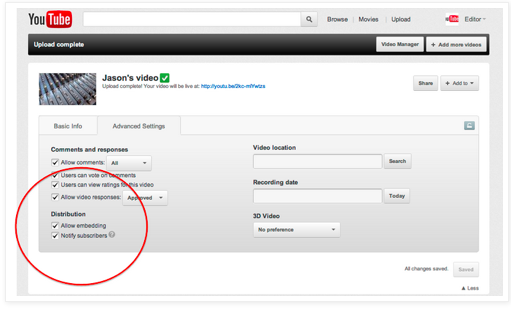 Many of you have told us you want more control and convenience when publishing videos to your YouTube channel. You want features that will save you time and give you more flexibility as you build an audience on your channel. Starting today all creators around the world will have three new publishing features: public videos that don’t notify subscribers, adding custom thumbnails while the video uploads, and a new tags editor. Your posts have more meaning for me. http://awriter.org/payforessay-net-review/ thanks for sharing. You can find more interesting articles if you'll visit this website.